Sorrento is on the western coast south of Naples. The bay of Naples has Naples on its northern side and Sorrento on its southern side. Capri is off the coast from Sorrento to the South West. Many tourists go from Naples to Pompeii and then onto Sorrento. From Sorrento they take a ferry to the island of Capri. We stayed at the Mediterraneo Hotel in Sorrento. 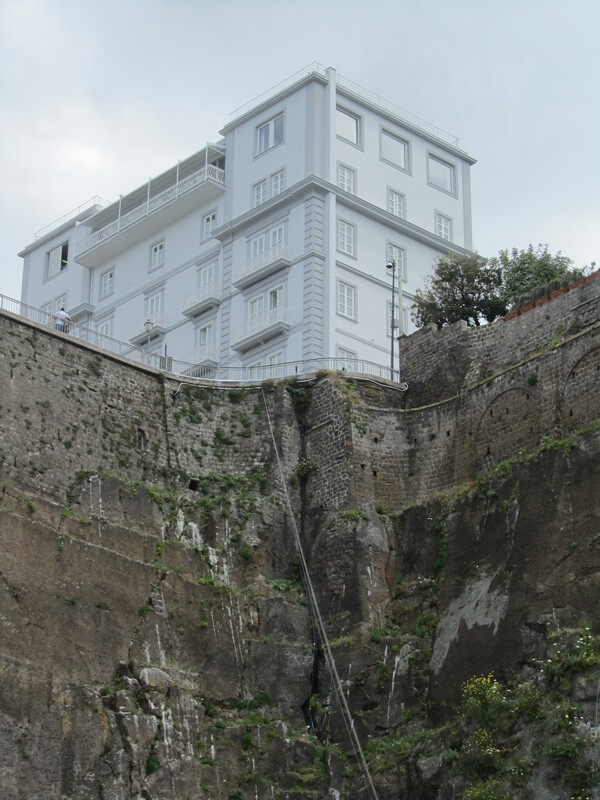 This hotel is on the coast just North-East of the center of Sorrento. You can catch a bus at the hotel to the downtown area, Piazza Torquato Tasso. In this square are many restaurants with both indoor and outdoor seating. It is a great place for lunch, dinner, drinks or a snack. You can watch the people of Sorrento go by. West off this square are many small streets with interesting shops for tourists. Sorrento is an easy town to stroll around. The Hotel Mediterraneo is located high on a buff overlooking the Bay of Naples. Across the street from the front entrance is a small park with an entrance to a hallway. In the hallway is an elevator the descend through the rock to the beach level and a great restaurant. The beach has chairs, tables with places for your wine or beer and a dock for boats. The ferry from Capri arrives at a dock not far away. It is a short taxi ride from that dock to this hotel. There is also a wonderful pool at the hotel. Next to the pool is a covered outside restaurant and a poolside bar. The grounds are very romantic and there is seating located in cozy read among the trees and plants. Sorrento is the western starting point of the famous Amalfi Coast Highway. This highway takes you along a curvy road to Positano, Amalfi and ends at Salerno. This is the Eastern end of the road and connects with major Italian Autostradas. They are both very beautiful. Each is unique in its beauty. I hope you get there some day.